HTC could be launching a new phone at an event in New York this week and, according to some pretty substantial Twitter leaks, it'll be a new Desire handset. 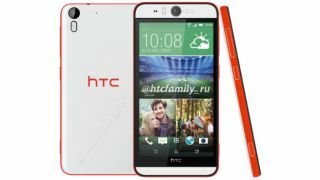 According to images and specifications posted by @htcfamily_ru, the Taiwanese company will reveal the HTC Desire Eye on Wednesday. Labelled the "ultimate selfie phone", the Desire Eye's headline feature will be a front-facing 13MP camera complete with a flash. As part of the company's Desire range, it will presumably sit below the HTC One M8 when it comes to pricing. As well as featuring two 13MP cameras, the HTC Desire Eye doesn't appear to be lack in the power department according to what we've heard so far. The phone will utilise a quad-core Snapdragon 801 processor, 2GB of RAM and 32GB of storage. The leaked images show a plastic, or polycarbonate, chassis wrapped around what we believe is a 5.2-inch Full HD 1080p screen. There's also a 2,400mAh removable battery and mention of a water resistance rating. So far we've seen two colour options, a red and white version and a light blue/dark blue choice. As usual though, we have to take these leaks with a pinch of salt until HTC confirms the existence of the Desire Eye. It's likely we'll know more after Wednesday's event. Read our HTC Desire 510 Hands on review.